Bold and bright prints are always a staple part of summer dressing. Whether you prefer small ditsy prints, or vivid graphic designs, the high street has a great selection to choose from. With Autumn coming up though, I personally prefer to tone down and swap printed maxi dresses for scarves, headbands and other accessories. 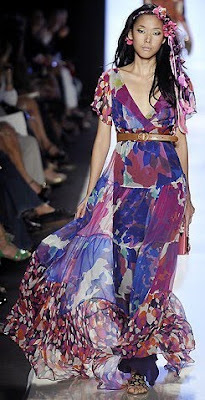 Floral neck scarves in particular have made an appearance in several designers collections for Autumn 2009, including Kenzo and Marc Jacobs. BEAUTIFUL. I love your taste on wearable-high fashion. Very inspirational. Thank you! the elie tahari design pretty much looks like malaysian floral batik prints. I love pretty prints, they look great for summer. Ihtijab has some great printed dresses.